Uganda’s oil: Commercial discoveries of oil reserves have been made in a number of areas including, but not limited to, Butiaba, Ngassa, Kaiso-Tonya, Kingfisher, among others. Despite Tullow Oil’s numerous contribution towards these discoveries, the oil firm has started to ease out of Uganda through sale of its stake. Uganda has shortlisted four companies from which it intends to select the bid winner to construct its $4.27 billion oil refinery, Energy Minister Irene Muloni has announced. "We hit a snag last year when we were about to sign with the Russians who pulled out. Now we have four consortia, that appeared to be of interest for us, and which we feel have the capacity. We will pick the winner from among these to build the refinery," Ms Muloni said on April 25. She was chairing a ministerial session during the joint Uganda Chamber of Mines and Petroleum, Uganda Freight Forwarders Association and Private Sector Foundation Uganda inaugural regional logistics expo and the third annual oil and gas convention that took place in Kampala from April 25-27 2017. Robert Kasande, acting director of the refinery in the Petroleum Directorate, was also guarded but told The EastAfrican that an announcement "will be made within a month." However, sources familiar with the oil-related deals and tenders told The EastAfrican that there have been eight companies/consortia in the bidding, which the Ministry of Energy has been considering. These are SNC Lavalin of Canada, Yatra Ventures LLC and Apro, both from the US and IESCO of Turkey. The others are Chinese firm Guangzhou Dongsong Energy Group, Spain's Profundo, Bantu Energy, a Canadian and Ugandan consortium as well as Italy's Maire Tecnimot. Uganda picked a consortium led by RT Global Resources of Russia ahead of South Korea's SK Engineering, to build the 60,000 barrels-a-day project, but the Russians pulled out citing Uganda's failure to meet a fresh set of demands. The government on the other hand argues that the Russians made fresh demands after matters had already been concluded, prompting Kampala to call off the negotiations. Ms Muloni said a decision needed to be reached soon to enable the joint venture partners - the three oil companies CNOOC, Total and Tullow - to make their final investment decision by December 2017. 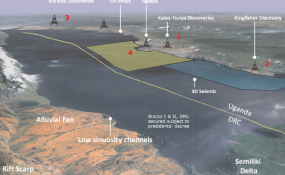 The investment decisions revolve mainly around the $3.5 billion East African Crude Oil Pipeline from Hoima district in western Uganda's Albertine Graben to Tanga port in Tanzania, for which a Front End Engineering Design (FEED) is ongoing and expected to be complete by August this year. The 1,445-km line will be the longest electrically heated pipeline in the world, transporting 200,000 barrels of oil per day. The FEED will detail technical requirements such as the layout of 36 well pads, technology required to drill 400 wells, and estimated cost of the infrastructure to start production on Exploration Area 1 and Exploration Area 2. In short, the FEED, which will also suggest engineering designs for the proposed 200,000 barrels central processing facility, will inform the joint partners on the actual cost of the pipeline. Another key project is the refinery, also to be located in Hoima, for which financing needs to be determined - The project developer owns 60 per cent stake, with other participating parties taking up 40 per cent. The refinery development also includes a product pipeline that starts in Hoima and terminates at Buloba, west of Kampala.